The Institute of Peace Leadership and Governance under The College of Business, Peace Leadership and Governance on Wednesday the 3rd of March 2019 hosted a Parliament of Zimbabwe Portfolio and Thematic Committee Chairpersons Workshop on Negotiation and Mediation. The workshop is jointly hosted by Africa University, the Swiss Embassy of Zimbabwe, the Centre for Security Studies, CSS and ETH Zurich. The workshop seeks to achieve three primary objectives which are to reflect on insights and the challenges of using dialogue, negotiation and mediation in Parliament, and on the specific role the Committee Chairpersons play in this undertaking. To jointly explore and further develop the conceptual understanding of consensus based methods such as dialogue, negotiation, mediation and process design and to finally further skills development of the Committee Chairpersons to facilitate nation building in their roles as negotiators and mediators. The national consensus building workshops are tailor made for three specific groups, these being, leaders within the church, chiefs and parliamentarians with this session aimed at the latter particularly the Parliamentary Committee on Defence and Security which oversees security issues with in depth knowledge and information sharing of the response to the recent catastrophic Cyclone Idai that heavily impacted Zimbabwe, Malawi and Mozambique being of particular interest. Over time, the training has generated reflections and discussions that revolve around the role of Committee Chairpersons within Parliament in consensus based nation building and has increased knowledge and interest based on negotiation skills, its relevance and challenges in the context of the work of the respective Committees. 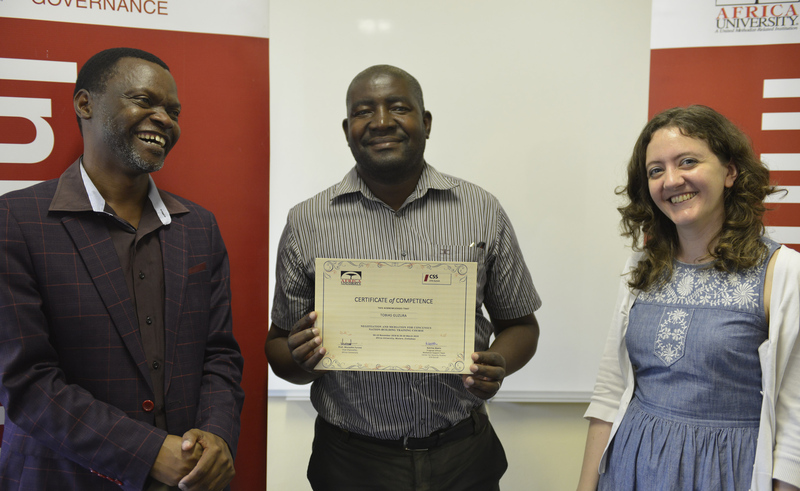 To date, the workshop training sessions have received positive feedback with many individuals and institutions going a step further to enrol for the for the Masters Programme in Peace Leadership and Governance offered by Africa University. Africa University is the market leader in peace and leadership related programmes and training that are designed to cultivate responsible leaders for Africa and to empower the citizens of the continent to create a more peaceful, integrated and progressive Africa.